Jack Lew, nominated by U.S. President Barack Obama to be the new Treasury Secretary, during the presidential inauguration on the West Front of the U.S. Capitol January 21, 2013 in Washington, DC. Later today I’ll be flying down to Waco, Texas, for a post-election forum held at Baylor University. It’s mostly on Saturday. Come by! I’m a bit late to this, but Brian Doherty’s thumbsucker about the Second Amendment implications of 3-D printing is fascinating. 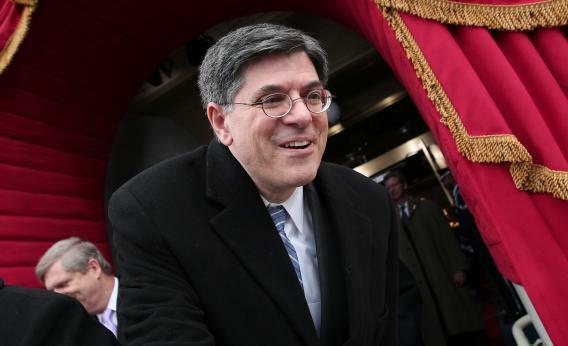 Andrew Stiles previews the questions that’ll be coming at Jack Lew. Virginia’s GOP gubernatorial candidate, probably a bit tired of explaining why he’s trying to block climate change research at public universities, muses about marijuana legalization. John Cassidy shames the U.K. over its austerity policies. Time talks to Kris Kobach, who is understandably skittish about this whole “Republicans giving up on self-deportation” wackiness.